Split – from many European airports. Combination with island hopping is possible: for example, a couple of days in Split and Dubrovnik, sailing and return flight. 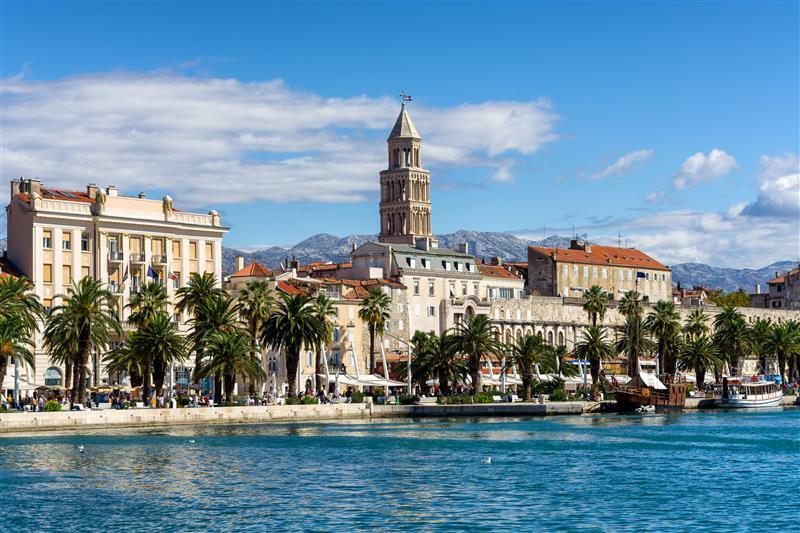 Thanks to its central location on the east coast of the Adriatic, the region of Split and Dalmatia ever since has played an important and extraordinary historic and cultural role. The entire area consists of a great hinterland through which the Cetina River is flowing and a coastal area with an archipelago of countless islands. A generous nature has created a rich and diverse region full of hidden bays, beaches, cliffs and karsts, emerald green groves, straits and the open sea. The islands Brac, Solta, Hvar and Vis are large and offer a beautiful landscape with small and major towns. The cities and little villages line up along the coast just like a thread. The hinterland consists of mountains, karsts and great fields and villages such as Sinj and Imotski, which have an urban character. The sailing area is perfectly suited for beginners as well as experienced sailors. Trogir is located only a couple of kilometres away from the airport of Split. The city centre with its old churches and little palaces is very worth seeing. The crooked streets and lovely restaurants offer the ideal start to this trip. From Trogir you could either sail south and visit Split and the nearby islands Hvar, Brac and Korcula. A visit of Hvar is particularly worthwhile, if you interested in discovering the old fortress from which you have a breathtaking view over the city and the numerous smaller and larger islands. These islands are very lush and forested in contrast to the northern Kornati Islands. In case you decide to book a sailing trip for 14 days you could even sail to Dubrovnik. Alternatively you could also sail north. Attractive destinations are for example Primosten, Biograd, Zadar and the southern Kornati Islands. The numerous little harbours, countless islands and fascinating bays offer a lot of variety.